The Child Nutrition Services Department of the San Marcos Unified School District prides itself on being innovative and relevant in the digital age. In doing so, the utilization of the district Web site is perhaps the most important vehicle to promote our program to parents, students and staff in the twenty first century. 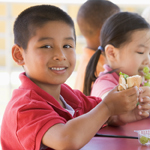 The Web site serves as an informational hub, which defines the framework for our department and identifies the goals of Child Nutrition Services. In creating an effective Web site, it is important to take into consideration who is accessing the Web site and what information they want to access. A Web site for school nutrition programs should have content that is relevant for a wide range of audiences and engage visitors through text, audio and visual mediums. We have learned that photos and video of our program engage more visitors on our Web site than any other form of communication. Including "calls to action" or social networking links can also engage visitors by allowing them an environment where they can interact with your department, which can be a great tool. The main pitfall to avoid with a Web site is allowing it to remain static. In order to continually engage your audience, it is necessary to update the Web site on a regular basis to keep things fresh. As long as you continue to post new content your visitors will continue to come back to find out what is new with the department and stay connected. Although there is no specific answer as to what a Web site should look like, it should ultimately be a reflection of your department and the goals you strive for in providing healthy meals.